To stand out from the growing competition in the market, it is important to establish a differentiation strategy. In my most recent blogs, I have been providing great examples of partners who use strong differentiation strategies to help them win more business and maximize their profitability. I recently had the pleasure of interviewing Terry Doherty of Doherty Associates based in the UK on his rather unique strategy to differentiate his business. Terry’s story is an example of two best practices that can help you build a profitable cloud business and compete to win. 1. Leverage your learnings and success in your first vertical to help pave the way for success in your next vertical. 2. Go beyond customer expectations by delivering exemplary service to win the heart of your customers. 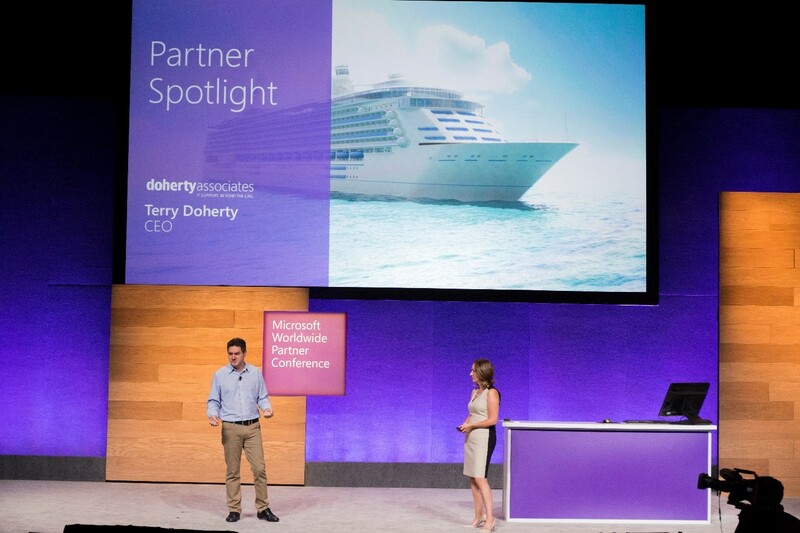 Doherty Associates are a Microsoft Gold Partner specializing in IT, Cloud, and Datacenter solutions. I asked Terry to share his experience carving out a niche for his business in the cruise ship industry. Here’s what he had to say. About 20 years ago he got a call from a vendor who said they had a bit of an unusual situation. They had a customer with a cruise ship that was having lots of reliability problems. They knew that we had done some of this type of remote and specialized work before and wanted us to go and have a chat with the client. So he did. On arrival, the owner of the cruise ship started off the conversation by saying “Look, you are the third person who has been here, I really don’t like computers and how are you going to help me fix this problem?” Terry’s response was that he needed to go and have a look at the problem before he could offer any suggestions. After checking out the situation in person, he returned and said there were two key issues. The first was that the IT wasn’t set up nearly as well as it needed to be, and secondly the hardware just wasn’t appropriate for what the client was trying to do. I asked Terry how he was able to expand his business after winning that first customer. He said, “That’s a good question, obviously, we spent quite a lot of time working with cruise ships after that. And we launched a campaign that told the story of the cruise ship.” Soon after, they got a call from a gold mining company who was in a similar situation. This was a great example of a best practice that we heard in our recent research with IDC which is that success in one vertical often leads to success in other verticals with similar challenges. Another element of his success was Doherty Associates’ strong attention to customer satisfaction. I asked Terry what lengths he was willing to go to for his customers. He had this to say, “Customer service is key. For example, years ago, the system went down on one of the ships we were looking after. This was before we had remote monitoring in place. On a cruise ship, the bills are printed on the last night on the ship and the credit cards get charged. On this ship, their system had gone down 2 days before the last day of the cruise.” But Terry didn’t let that phase him. Terry provides a good and repeatable example of going to great lengths for your customers and how that dedication helped him grow his business. Are you looking to differentiate your cloud business but don’t know where to start? Download the Differentiate to Stand Out ebook. Please feel free to reach out to me via email, Twitter, or LinkedIn with any thoughts and feedback. Don’t forget to share your insights on customer service in the comments below!